Our first trip to the Jackman Area and Cozy Cove Cabins was a great introduction to the area. We made a last minute reservation here after finding out that Bingham was snowless. SO glad we did. The snowmobiling was great and on Wednesday morning when our sled didnt start, Steve was right there to give us a hand. I may be jumping the gun but I think we are finally going to be done with winter. Last week we had a little more snow and temperatures in the low teens. It started to warm up (balmy 30) yesterday but woke this morning to a little more snow on the ground. The good news: it is 40 and raining now and in the 2 day forecast. Hopefully, this rain will help to melt some of the snow down. Ice shacks are off Big Wood as season ends in a couple days anyhow. Some areas in Maine, open water fishing has already begun. Just 50 + miles south of us, their flowers are starting to pop up. Here is the image I took this morning of the new snow! I cannot believe what I am seeing. It is snowing 🙁 Although not big heavy flakes, there is still quite a bit coming down. The temperature is about 30ish so perhaps this is better then rain. The birds are chirping and nesting, the snow is melting, the geese are squawking, and it is about that time again to see who can guess the Ice Out date for Big Wood Lake. Last year it was on April 28th. 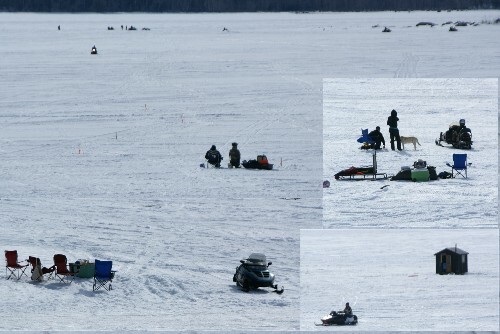 Today, March 20th they are still riding the snowmobiles across the lake and ice shacks are still out…as well as Ice fisherman. 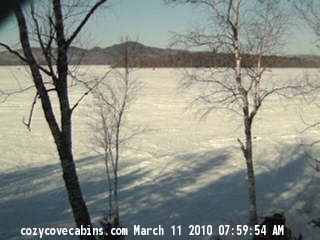 Add a comment to this post with your guess as to the date the ice will go out. We can only accept one date per person and do not guess the same date that is already posted. 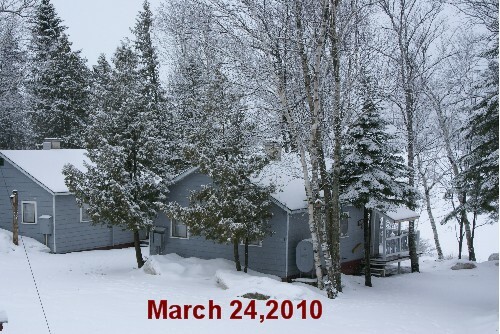 The exact date will be what the Town of Jackman records as the ice out date for 2010. 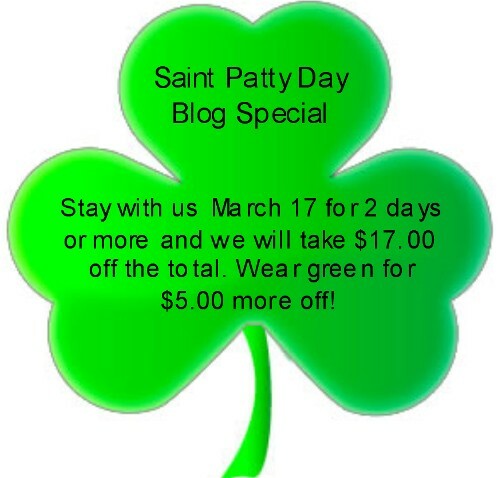 Whomever chooses that date, will win 50% off one night when they stay with us 2 or more days this summer. 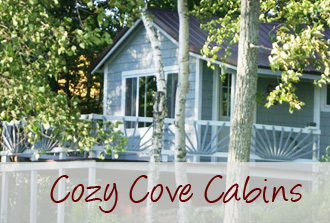 Please Note: Only one discount permitted per stay at Cozy Cove Cabins and our same discount rules apply. Be sure to send us your email address too so we can get in touch with you. It will not be posted on the comment, but we do need to know it. You must submit your date before April 20th to be eligible. I think it may go out earlier this year. 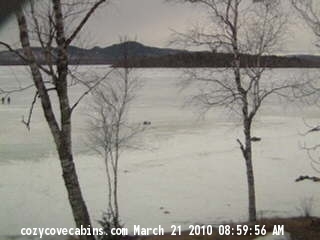 Here is a shot of the lake from our webcam on 3-21….can you see the guys fishing still? Looking for some great spring riding! Steve and I took a short run up to the clubhouse via the lake trail and captured a bit of video. I have not posted to our website yet but if you are on FACEBOOK, become of FAN OF COZY COVE CABINS to see a few I put up there. Some rough areas, some bad spots on the curves but still some pretty good riding, even on a 2 up 🙁 Our guests say the more north you go the better the trails still are. Wonder how they will fair the rest of the week. Could still be one more weekend of some decent spring riding. Below is a collage of fun (Relaxing, fishing, riding) in March on Big Wood! The trails have been groomed and reports from our guests yesterday is that trails north are fantastic. And with this weather, ice fishing on Big Wood should be perfect ❗ If you are not on your way up, you need to call and make plans. WOW 😯 Yes we still have snow. Yesterday, our guests told us that there is some really good riding north…Club house loop is great, as that is all they did on arrival. Some trails were pretty soft due to the warmer day. In town trails are pretty bare in areas but the lake trail is still good. Temperature now at 9am is 22 and the wind is blowing. I even saw a little bit of snow falling ❓ That was not in the forecast so kudos to mother nature. With the cold weather in the forecast for today and tomorrow, trails should stay in pretty good condition through the weekend, thanks to our groomers and the Border Riders Club. As soon as we hear more details on the trials, we will let you know. Trails are only getting better. The nights have been cold and the day temps have not gone much above mid 30s which is letting the groomers do their job. If you see any of the groomers or stop in to Jackman Powersports, let them all know their efforts this season are appreciated. Those involved with making the trails what they are have really worked hard this season to give you some great riding opportunities. Also note that the sled dog championship races take place this weekend at the clubhouse. The ONLY trail affected will be the section across Big Wood Lake to behind the clubhouse. They have made a by pass coming from Border Riders North to turn at the Holeb Road on a groomed trail which will take you to the clubhouse. Otherwise, you will need to use in town trails to access the system. Needless to say, with all of this snow we got and the Championship sled dog races this weekend, I believe the town is full. RIDE SAFE!